This little piggy went to market, This little piggy stayed home, This little piggy had roast beef This little piggy had none, And this little piggy cried wee wee wee all the way home. We’re going to be straight with you - the more we do the whole “This Little’ Piggy” song and toe-pulling routine, the less it makes any sense. In fact, we did it to a 5 year old a couple days ago and she looked at us and said, “What does that even mean?” And we didn’t have a good answer for her! The best we could come up with was, “Uh, so…your toes are cute and chubby, and little piggies are cute and chubby, and so this rhyme makes it seem like your toes are like little piggies, and…” And then that 5 year old stared at us like she couldn’t possibly be more disgusted with our attempted explanation per the logic of “This Little Piggy”, which felt great. 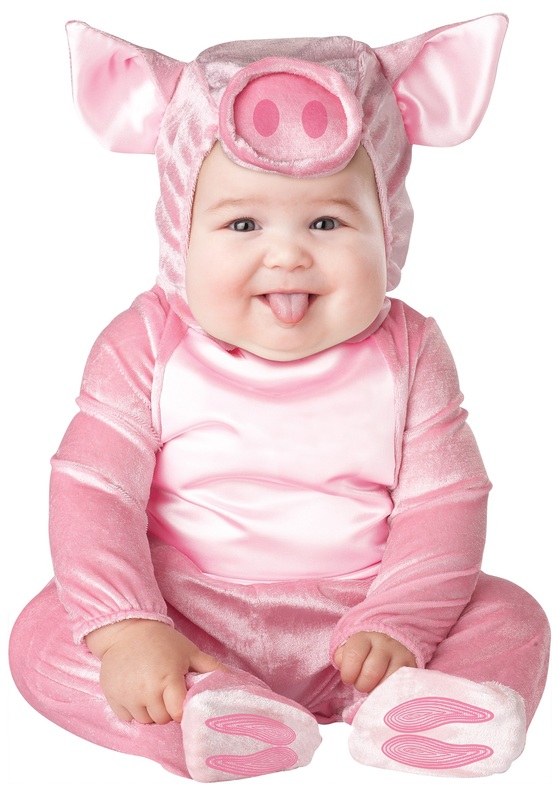 But none of that even matters right now, because the one thing that does make sense is putting your cute and cuddly baby into this Infant Lil Piggy Costume is! Seriously, how totally stinking (pun alert!) adorable is this costume? The pink velvety jumpsuit with a light pink satin tummy will make your little one look like the most huggable little piglet this side of the farm, and with the skid resistant purple feet with pink hoof shaped grips, that little cutie will be able to toddle around the - ahem - "market" safety and surely. What really brings it all home, though, is the Piggy hood with a plush snout and satin lined ears. What's the old saying about making a satin purse out of a pig's ear?! Never mind, that idiom is kinda gross...but in this Infant Lil Piggy Costume, your lovable little baby will making everyone who sees them squeal and go wee wee wee (too far?) with delight!